How Does a Deck Differ From a Porch? You might see the terms deck and porch used interchangeably. But what makes them different? What does your home’s current exterior look like? Your windows, roofs, and siding are all key elements of keeping your home safe during the foul weather fall brings with it. But there are two more elements of your exterior you might not immediately think of; these are the deck and the porch. These terms might sometimes be used interchangeably, but how exactly are they different? You’ll see porches protected by an overhang attached to the roof. By contrast, most decks will be open-air structures, unless they are covered up to form a sunroom or other similar home addition. 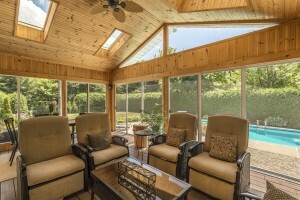 You might also be familiar with the structure known as a screened-in porch. Porches can only connect to the first floor level of your home, but you can elevate your decks. Do you want a deck that meets your basement? Great! Would you prefer a deck you can access from the master bedroom on the top floor? That’s not a problem, either. You can also choose to build a detached deck, while porches cannot be built this way. Over the summer, you most likely turned your deck into a second dining room. Now that it’s turning colder, the grill and some tables and chairs might not be the best idea. Instead, why not consider adding a fire pit to gather around, trading stories and enjoy some spiced apple cider? Keeping a designated bar area set up nearby might not be such a bad idea, especially if you wanted to prepare that cider in a slow cooker instead of over the fire. Try filling up your porch with interesting knickknacks and comfortable places to sit. Whether you sit outside in the summer and spring with iced tea or in the fall and winter with hot chocolate, you’ll want to spend some time here. Warmer paint tones will turn the space into a cozy hideaway, especially if you close it up and make your porch screened. Get a Brand New Deck This Fall!